Tony Escapa & friends performing "Escape From Whitestone"
Tony Escapa recently visited the LP®Studios to record "Escape from Whitestone" for the 2004 Holiday CD. The band consisted of Tony Escapa on timbales/bells, Reinaldo De Jesus on congas, Robert Rodriguez on piano, Mike Rodriguez on trumpet and Ricky Rodriguez on bass - and they nailed the recording on their first take! 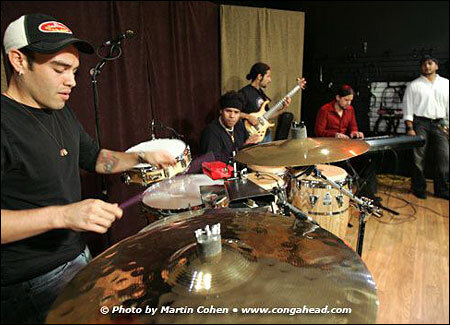 Tony Escapa, a native of Puerto Rico, attended high school in Florida, and studied at the Berklee College of Music in Boston. A complete percussionist, as comfortable playing drumset as he is playing timbales, congas and miscellaneous percussion. Not only is he a player of salsa music, but music from around the world. Listen to him and his stellar group perform his original composition at the LP® studio. To see the MUSIC VIDEO from this event, please CLICK HERE.